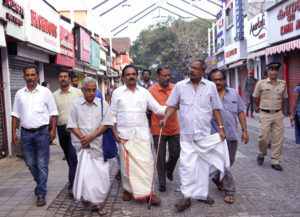 Kozhikode’s pride ,popularly known as Mittayitheruvu (SM Street) has been opened after a long time’s beautification project.Many arts and cultural programs marked the inaugural ceremony. Massive participation of people in high celebration mood created a festive mood in and around Mananchira. Chief Minister Pinarayi Vijayan inaugurated SM Street heritage project in the presence of people’s representatives and cultural leaders. Mittayitheru renovation project had been discussed long back and there were many hurdles on its way. Kozhikode district collector UV Jose took up an initiative to materialise the long time dream of Calicut citizen and merchants . A 620 crore rupees project for SM Street beautification got a lift when a major fire broke out at the street. Kozhikode Corporation, the district administration and people’s representatives joined hands to make the project , a reality. This News was posted on Saturday, December 23rd, 2017 at 6:57 am and is filed under City Talk. Jnanpeet laureuate MT Vasudevan Nair today visited the renovated Mittayitheruvu (SM Street).Kozhikode district collector UV Jose accompanied MT.